Observers are digital algorithms that combine sensor outputs with knowledge of the system to provide results superior to traditional structures, which rely wholly on sensors. Observers have been used in selected industries for years, but most books explain them with complex mathematics. Observers in Control Systems uses intuitive discussion, software experiments, and supporting analysis to explain the advantages and disadvantages of observers. If you are working in controls and want to improve your control systems, observers could be the technology you need and this book will give you a clear, thorough explanation of how they work and how to use them. Control systems and devices have become the most essential part of nearly all mechanical systems, machines, devices and manufacturing systems throughout the world. Increasingly the efficiency of production, the reliability of output and increased energy savings are a direct result of the quality and deployment of the control system. A modern and essential tool within the engineer's kit is the Observer which helps improve the performance and reduce the cost of these systems. George Ellis is the author of the highly successful Control System Design Guide (Second Edition). Unlike most controls books, which are written by control theorists and academics, Ellis is a leading engineer, designer, author and lecturer working in industry directly with the users of industrial motion control systems. 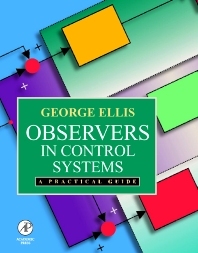 Observers in Control Systems is written for all professional engineers and is designed to be utilized without an in-depth background in control theory. This is a "real-world" book which will demonstrate how observers work and how they can improve your control system. It also shows how observers operate when conditions are not ideal and teaches the reader how to quickly tune an observer in a working system. Software Available online: A free updated and enhanced version of the author's popular Visual ModelQ allows the reader to practice the concepts with Visual ModelQ models on a PC. Based on a virtual laboratory, all key topics are demonstrated with more than twenty control system models. The models are written in Visual ModelQ ,and are available on the Internet to every reader with a PC.